Today Nvidia has released its much anticipated flagship card, the GTX 590. 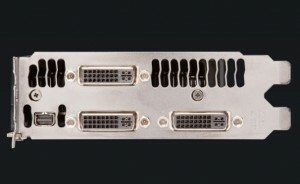 This video card consists of 2 GPU’s on one PCB and can drive a 3 monitor setup in 3D surround by itself. 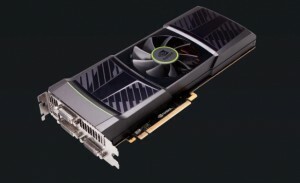 Nvidia touts this as the most powerful DX11 graphics card ever built. Nvidia GTX 590 (Photo courtesy of Nvidia). 1024 Cuda cores (512 from each GPU). 3GB DDR5 (1.536GB for each GPU) running at 853Mhz. 607 Mhz Core clocks and 1215 Shader clocks. Vapor chamber cooler for each GPU for improved cooling capability. 3 Dual-Link DVI and 1 Mini-Displayport. 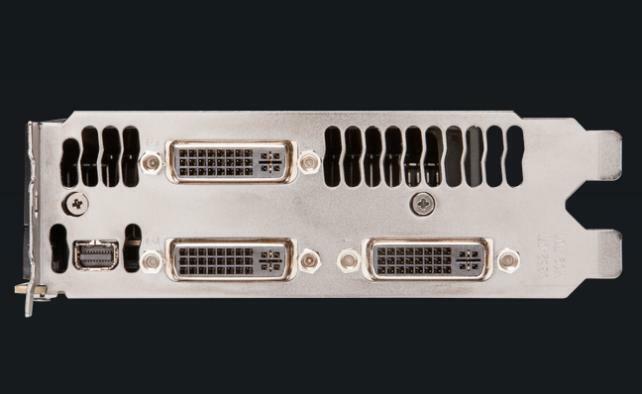 Triple Dual Link DVI + Mini-Display port (Photo courtesy of Nvidia). 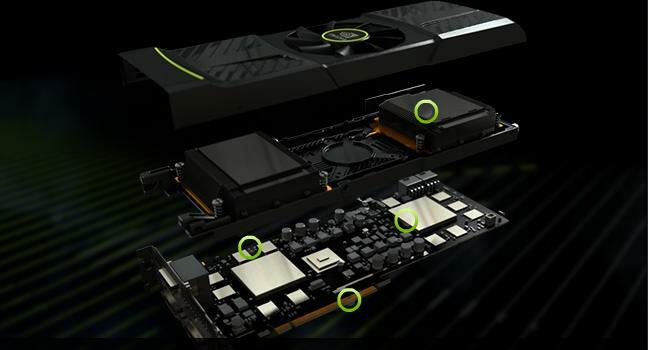 Vapor Chamber cooling for each GPU (Photo courtesy of Nvidia). Product Demo : The Director Of Technical Marketing for Nvidia, Tom Peterson, put together a video overview of the 590 showing you the the internals, including the new cooler design, and he also compares it to past dual GPU cards. Tom then measures temperatures and noise before trying the card out in Crysis 2, Homefront, and Crysis 2 in 3D Vision Surround mode. How-to for Quad SLI : The launch of GeForce GTX 590 brings with it the ability to build a Quad SLI gaming PC – four GTX 500 GPUs combined to deliver some wicked FPS. The system requirements of Quad SLI may not be for the faint of heart, but if you have the budget and the skills to build a Quad SLI rig, then you’ll end up with the sweetest PC on the block. In game performance : Nvidia has provided some information as to how this card performs across 21 games. Their resolutions range from 1680×1050 to 2560×1600. The settings used are what they call Optimal Playable Settings (OPS) which provides maximum graphics quality while maintaining at least 30FPS. The MSRP of this card is $699.00 (which translates to about $300 less than GTX 580’s in SLI). That pricing is very competitive with AMD’s flagship dual GPU video card, the 6990. Popular online e-tailers have them available now. Tigerdirect is selling them for $729.99 for the Asus model and $739.99 for the EVGA model. Hopefully the competition between the HD 6990 and the new GTX 590 will drive down prices quickly so the consumers win! :rofl: Now that's funny. Fixing; thanks guys. The link is also messed up, the link has "lastest" instead of "latest"
A well, once again "the most powerful" video card is released, just another day in the office. This will just continue on and on. I'm behind the loop. Is this the equivalent of GTX580 SLI? It is stated to be 1,5 times faster than GTX580, which means it can be as good as SLI GTX580, since SLI does not mean 100 % performance boost. HD6990 beats it if both are at stock clocks, too. So I assume then that these new era of multi GPU cards use chips specifically designed for them? So you can't make the correlation that GTX590 = 2x GTX580/GTX570/GTX560/whatever? Its 2 580's with lower clocks. Looks cool, but as soon as I buy it, the new one will be out a week later :P.
The 295 was like 2x 280s with the memory and interface from the 260, 275's didnt come until a year or more later. Well if you only have one full 16x bandwidth 16x slot, this might come in handy.